The German scientist Alexander von Humboldt and his expedition partner, botanist Aimé Bonpland, traveled through Central and South America between 1799 and 1804. Under a Spanish warrant, they explored the Orinoco in Venezuela, surveyed and gathered plant and animal specimens, and studied the geology and mineralogy of Colombia, Peru, and Mexico. They climbed Chimborazo, the highest summit in Ecuador and what was then thought to be the highest summit on Earth, reaching the highest altitude of any human before succumbing to oxygen sickness near the summit. The complete record of the expedition, commonly known by the title of the first of its 23 volumes, Voyage aux régions equinoxiales du nouveaux continent, was printed in Paris between 1805 to 1834 and is a comprehensive work in the fields of physical geography and geology, natural history, and ethnography that served as a model for future scientific expeditions. The volume, the atlas to the exhibition, is the largest and most elaborately-produced volume in the work. The color prints and large-scale, elaborate engravings convey the extreme scale of the landscape of the Americas to a larger audience and document, in detail, many of the ethnographic and natural specimens Humboldt and Bonpland collected. 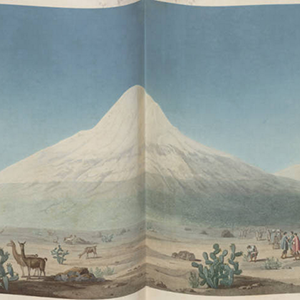 This digital edition of the Humboldt Atlas is the first to be digitized and made freely-available on the web.